Not long ago, Eddie Brock was the biggest name in San Francisco TV news. But then he disobeyed his boss, and his popular show – the hard-hitting Eddie Brock Report – was cancelled. Brock was fired. Now he can’t find a job, even though everyone at the local bar recognizes his face. “Aren't you Eddie Brock?” a patron asks. Yes, he is, but name recognition alone doesn’t pay the bills. Then Brock gets a break. A scientist from the Life Foundation research company contacts him, alleging that her CEO – a crooked guy named Riz Ahmed – is conducting deadly experiments on clueless human patients. She wants to expose him. The research involves injecting an alien life form into the person and then monitoring them for reaction. Some die, others wither in pain. The story gets even crazier: The CEO wants to create a new species of alien-human hybrids that can survive in outer space. Brock isn't sure what he can do to help, but that's okay. He’s searching for the truth. He even enters the building at night to conduct an investigation, taking mental notes and pictures, too. That’s when the unthinkable happens. Brock accidentally gets infected by the alien life form (called a "symbiote"). Yet he doesn't die, instead, he's transformed into a powerful human-hybrid thing. He eats raw lobster, climbs buildings, and sometimes, he looks like a large, grotesque lizard. 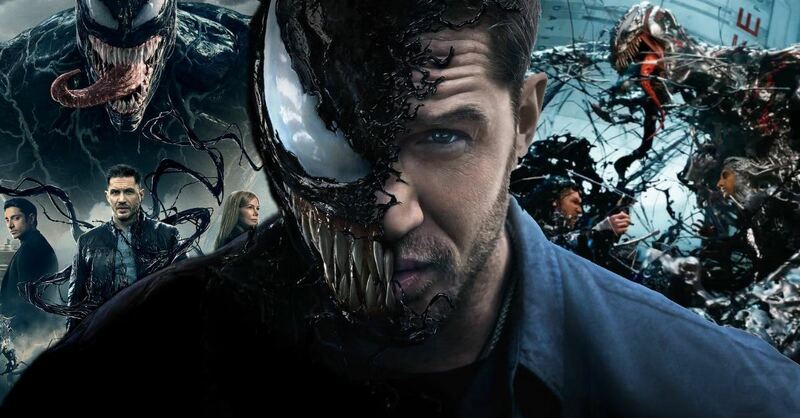 The movie Venom (PG-13) opens this weekend, starring Tom Hardy (The Dark Knight Rises) as Brock, Riz Ahmed (Rogue One) as Drake, and Michelle Williams (The Greatest Showman) as Brock’s girlfriend, Anne Weying. It's a spinoff from the Sony Spider-Man franchise and is based on the Marvel character of the same name. And more so than most superhero movies your children have watched. Brock becomes Venom, a creature that can hide within his skin but who has total control over Brock’s actions at all times. Sometimes, Brock looks like, well, Brock. Yet other times he turns into a giant fanged creature that eats people. (Yes, literally.) Venom bites the heads off several bad guys, although it happens so fast we don’t have to experience the details. Other times he’s tossing around SWAT team members, punching police, and destroying cars. Bullets don’t harm him. When the movie’s not violent, it’s plain scary. Individuals appear possessed when the alien life enters them. That’s because Venom is just plain ugly. The film also contains a ton of coarse language (about 50 words and a few f-bombs and GDs, if you’re counting). I’m a big fan of the Marvel universe – especially the Spider-Man and Avenger movies – but this one is only so-so. It’s not a bomb as some are calling it, and it’s also not as bad as the horror-movie-like trailer, but as a superhero movie, it’s just goofy. (More on that below.) The first third of the film is interesting, because Brock, as a journalist, is chasing the truth. The second third of the film is passable, because Brock is coming to terms with his new identity. It’s the movie’s final act that is confusing. It’s not easy to wrap up a superhero movie when the main character is a villain. Thankfully, the final few minutes clear things up a bit. Venom may be movie’s first villain-turned-antihero-turned-superhero. At least, that seems to be the trajectory. Remember: Venom was a very bad dude in the Spider-Man movies. So, he’s a ruthless killer, right? Not really. This means he’s a Deadpool-type character, right? I’m not sure. We’ll have to wait until the sequel to find out if he goes all-out superhero – perhaps like the shadowy figure Batman – but for now, he’s an amoral creature who has an appetite for raw meat. Here’s hoping Sony doesn’t go the Deadpool-esque route. Our society needs less crassness, sarcasm and moral ambiguity, not more of it. We need superheroes who desire truth and justice. I’m hoping the next film is like the final 10 minutes. I’ll leave it at that. Drake does a great job recounting the story of Abraham and Isaac. He just gets the point of the story all wrong. From Drake’s perspective, Isaac was the hero and God was the villain who eventually abandoned humanity. That’s why we have war and poverty, Drake says. But Drake is going to save humanity – “I won’t abandon us” – by creating alien-human hybrids who can live on another planet. The world, he says, won’t last much longer. Drake’s idea, of course, will require tons of people to die for the cause… as laboratory rats. They’re the “Isaacs.” Who cares about ethics in medical research? And a post-credit scene, too. The mid-credit scene helps set up the sequel, while the post-credit scene involves the next Spider-Man movie. Both are worth watching, but the first one is far more important to the plot. It also includes a well-known actor. Stay in your seats.